Share the post "News: WIN! 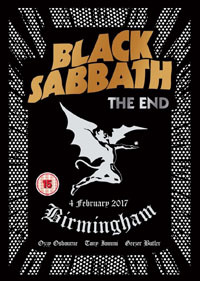 BLACK SABBATH The End DVD (Competition starts 27 November)"
Here’s your chance to win a copy of the BLACK SABBATH ‘The End’ DVD. Filmed on 4 February 2017 at their final show in Birmingham, the concert is captured in its entirety, plus The Angelic Sessions feature the exclusive final studio recordings by the chief architects of the heavy metal genre. The End captures a once-in-a-career performance, an essential snapshot of musical history and a fitting farewell to true innovators, Black Sabbath. We have two copies to giveaway in our latest competition. This entry was posted in ALBUM REVIEWS, ALBUM REVIEWS (Mobile), All Posts, Competitions, NEWS and tagged Black Sabbath, competition, DVD, Geezer Butler, Ozzy Osbourne, The End, Tony Iommi. Bookmark the permalink.